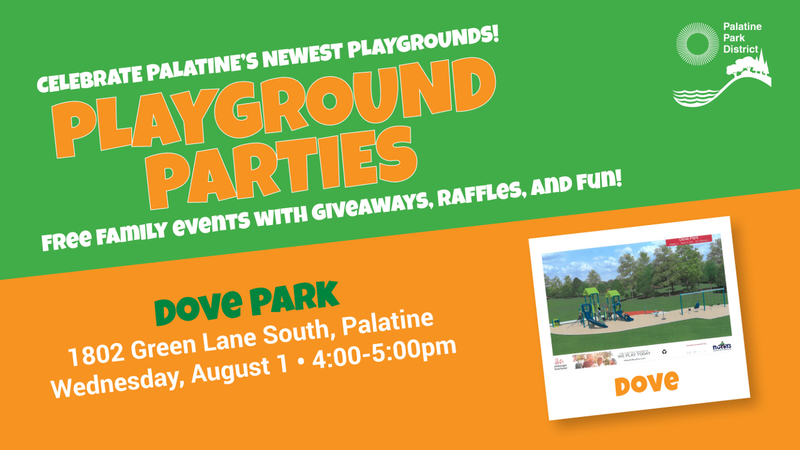 Celebrations for Palatine Park District’s two newest playgrounds will be held in Palatine parks. A Playground Party is scheduled for Hawthorne Park, 210 S. Brockway, on Tuesday, July 31 at 6:00pm and a Playground Party is scheduled for Dove Park, 1802 Green Lane South, on Wednesday, August 1 at 4:00pm. These free events will include giveaways, a free raffle, and lots of family fun on the new playgrounds. Palatine Park District conducted two “What’s Your Way to Play” surveys in Spring 2018, one for each park, allowing the community to vote on playground equipment choices including slides, overhead climbers, deck climbers, panels, spring riders, freestanding play options, and overall playground colors. The elements chosen by the public were all incorporated into the final playground design at each park. The District will be conducting similar surveys each year for the playgrounds that are slated for replacement. Palatine Park District is responsible for 735 acres of open land in Palatine including 50 park and facility locations that are home to 30 playgrounds. The Parks Department inspects and maintains all of the playgrounds to ensure the District is offering safe places to play for the community. Two of the District’s staff members are Certified Playground Safety Inspectors through the National Recreation and Park Association (NRPA) and an additional three staff members are certified playground inspectors through the Park District Risk Management Agency. All of the playgrounds are part of an overall District-wide equipment replacement schedule. Based on inspections and equipment condition, playgrounds are usually replaced every 14-16 years.